I've noticed lately that I've named a great number of my pieces after food. Sweet, succulent and rich foods that bring to mind not just flavors but colors. 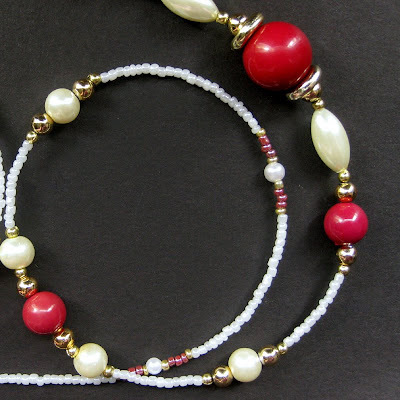 This handmade beaded lanyard is another one of those with raspberry red beads combined with creamy pearls on a strand of white. Here where I live, the harvests are in full swing and berries are a theme nearly everywhere you go. In recognition of that, beads in raspberry shades and glass pearls in a soft shade of cream are combined on a strand of white with a hint of gold accents in this stylish badge lanyard with a convenient 1 cm ring at the end. This piece is perfect for badge, keys and more. In fact, I recently made a similar one for myself with a lobster hook attached to the end to hold my clip-on sunglasses so I wouldn't lose them when I go in to shops on sunny days. The nape of this strand is created to be comfortable against the back of the neck with decorative beads further down along the strand so they are shown off to their best advantage. This 38" in length (96.5 cm) beaded lanyard is made with a sturdy no-clasp design for added security. Just toss it on over your head and you're ready to go!